APRIL 2, 2019 Opinion | 2 New Languages Why Baylor should offer Cherokee and other languages. Arts & Life | 6 A world of photos Baylor alumna travels globe while taking photos along the way. Sports | 7 Best of the best Bendeck and Lah named No. 1 doubles team in the nation. TOGETHER TO TAMPA Lady Bears and head coach Kim Mulkey celebrate following Baylor’s 85-53 win over Iowa on Monday in Greensboro, NC with their trophy. The first time Baylor has made it this far since 2012. Baylor students launch social media network app RAEGAN TURNER Staff Writer A new social networking app called Friends has been designed and launched by a team that includes Baton Rouge senior Hunter Freeman. Since its release on Thursday, Friends has gained over 1,000 users. The app, which links people through their friends’ network, was designed in order to help users make connections and initiate genuine relationships. Freeman is one of the co-founders of the Friends app. He lists finding business partners and supporters, sharing music or other art forms, as well as just meeting new companions as some of the possible ways to utilize the app. This multi-purpose design along with the way users are united with one another, explains why the app is notably different from other forms of social media. BETO 2020 Former Senate candidate Beto O’Rourke recently announced his bid for the 2020 presidential elections, effecting the nation and Waco residents who participated in his last campaign. Sunday, March 31 marked the first night of FM72, an ongoing worship and prayer event coordinated by Baptist Student Ministries. Students gathered on Fountain Mall to kick off the three-day event with two hours of petition, praise and preaching. Dallas junior Sam Hotz was eager to come and experience the movement after hearing about it at Highland Baptist Church. Not only was Hotz part of the crowd, but he also served in the prayer tent with his BYX fraternity brothers. “I went to FM72 because my church had talked about it, and it seemed like a really cool thing to be a part of. It seemed like one of those things that if you missed it, you would miss out on a big piece of history,” Hotz said. “I wanted to see where God was moving on this campus, and I also volunteered at the prayer tent and got my fraternity to do that as well, so that was pretty cool.” Nightly gatherings have been planned for 8 to 10 p.m. until Wednesday. Speakers at these times include Jonathan “JP” Pokluda, Jennie Allen, Jonathan Tremaine Thomas and Harrison Ross. They will be accompanied in worship by Jay Thomas, Jimmy McNeal, Jaleesa McCreary and other local worship leaders. that, for the most part, has not changed since the colonization of America. Baylor prides itself on being a top-level research institution, and part of being a leader in academics means pushing the boundaries of what is represented in school curriculum. Becoming more inclusive toward the Native American population and offering courses such as Cherokee as a foreign language, or even Native American Studies as a major or minor would help bring inclusivity and connect the Baylor population with a culture they may not know much about. official way to defend themselves. It is one thing to be non-affirming, another to be bigoted and hateful, and this certainly makes Baylor look hateful, as the fliers had the Baylor Student Activities seal of approval. How does having approved fliers that merge communist propaganda with LGBTQ symbolism around campus make Baylor look good? How does inviting a fascist to campus align with the current goal of the “Illuminate” program to be a light shining in the world? How do either of these things treat our LGBTQ neighbors with love and acknowledge the inherent dignity that they too have, as individuals made in the image of God? It doesn’t. Period. However, I have not heard only criticisms. The amount of people I have seen and heard about speaking out against this event is both promising and encouraging. I’m not sure what the university will choose to do about this event. I hope they cancel it; we are a private university with a reputation to improve, after all, so I believe we certainly have the right to do so. I hope that YAF does some serious soul-searching as to why they decided it was a good idea to bring a self-described fascist to campus when they say they support freedom; if they wanted to bring a non-fascist to campus to speak and abstain from inflammatory and harmful rhetoric in their posters, then I would certainly be happy to leave the fliers posted next time. And I hope that, in the long run, Baylor will grant a voice to groups like the LGBTQ community so that we can have conversations about this and similar issues not as empowered to powerless, but as equals. Until then, let’s work to better our university. Michael is a junior international studies major from Memphis, Tenn.
Opinion Editorials express the opinions of the Lariat Editorial Board. 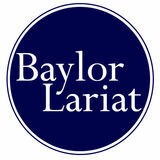 Lariat Letters and columns are the opinions of an individual and not the Baylor Lariat. 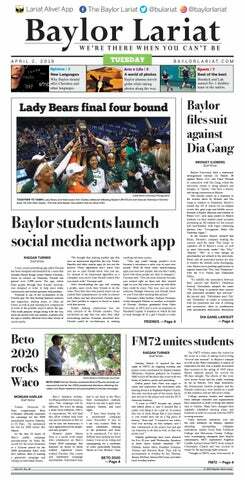 Opinions expressed in the Lariat are not necessarily those of the Baylor administration, the Baylor Board of Regents, the student body or the Student Publications Board. Lariat Letters To submit a letter to the editor or guest column, email submissions to LariatLetters@baylor.edu. Lariat Letters should be a maximum of 500 words. The letter is not guaranteed to be published. Sigma Chi, began the event, which has now included around 40 men representing seven fraternity chapters. Katy sophomore Hunter Nessen, a member of FIJI, hopes that fraternities on Baylor’s campus can continue to work on promoting the positive work that the groups do in the community and the ways in which chapters support one another. “People don’t realize all the good that fraternities do, especially the fraternities at Baylor,” Nessen said. “We have done so much as a chapter in small ways to impact our community and we have many great ideas for the near future. FRIENDS (left to right) Gill Walker, Toliver Freeman, Zachary Freeman, Todd Sterling and Desmond Chase at the launch party for new social media networking app Friends. to find a suitable date for one of his friends was the catalyst of the app’s development. This situation is the process the creators of Friends are trying to mimic yet simplify. “If you think about how most people meet their significant other, or the best way to get your next job, or how best friends are introduced, it usually happens through your network of friends. So, we’re bringing this widely-adopted concept in the real word to the digital world,” Freeman said. learned from the 2016 election that debates put a magnifying glass on one’s life. When this happens to Representative O’Rourke, America will realize that there are far more qualified, accomplished, and substantive candidates on the left,” said Soo in this comment to the Lariat when asked about feelings towards Beto’s presidential campaign. The vice president of Baylor Democrats, Zach Tufenkjian, a freshman political science major from Hoffman Estates, Ill., gave a statement on behalf of the organization. “Naturally, some of us are more receptive to Beto’s campaign given his Texas residency and 2018 Senate campaign. However, we firmly believe we have a wonderful field of candidates running at the moment, each with their own unique traits and accomplishments. Despite having so many candidates vying for the nomination, we are unified in our common interest of promoting a platform that will fight for all Americans, regardless of race, ethnicity, gender, sexual orientation, socioeconomic status, etc. We look forward to seeing Beto and other candidates on the debate stage in June, and wish them all the best of luck on the campaign trail!” said Tufenkjian. According to the New York Times, Beto’s campaign platform is strong on immigration, gun control, health care, climate change, criminal justice and trade agriculture. FM72 Events for FM72 are meant for all college students, not just Baylor students, to consistently pray for 72 hours and features worship and speakers on Fountain Mall until Wednesday. was so powerful to see all of the nations as students come together as one. Everyone should come again tomorrow. Literally these next couple of days are going to be crazy,” Castillo said. Along with hosting nighttime celebrations, Fountain Mall has become home to a stage as well as multiple prayer tents that are operating 24 hours a day. Volunteers are stationed in and around the tents in order to provide a student-driven, community atmosphere where those passing by feel encouraged to stop and participate in praying for themselves and others. the word ‘Dia’ on March 25 of this year right before they filed the suit,” Brimah said. “It all just felt like a play on their side to try and take down the T-shirts. I complied with them — I shut down the site and put a password on it so no one could get in, I disabled the checkout and unpublished the social images.” Brimah mentioned that his goal with hosting the Lil Jon concert is to ultimately provide students with a fun and safe event to partake in during Diadeloso and that he hopes his experience planning events around the Baylor and Waco communities will help him further his career in the event and music industries. “My biggest thing has been to try and foster a safer environment for students to have fun and party in. I’ve been in the party scene for a while and I’ve seen how disorganized things can get,” Brimah said. “This is something I’m very passionate about because the music industry is where I’m trying to get to. There’s not really a better way to get there than promoting events from the ground up — there’s a nice starter scene in college where you can book smaller artists and build a name for yourself over time. That’s the path I’ve been going on but it has been significantly more difficult because of Baylor and the image they want to uphold.” Despite the difficulties that the concert has caused, Brimah said that the event will still occur but is not in any way affiliated with Baylor. Baylor called in the lawsuit for Bleux and all associated parties to cease using university marks and transfer the domain name thediagang.com. Justin and Hailey Bieber had social media ablaze with their pregnancy April-fools post featuring an ultrasound. WANDERLUST After quitting her desk job, Baylor alumna Julie Copenhaver packed up and began her journey across the world with her camera. After trips to Europe, Australia and Africa, Copenhaver looks forward to many more trips and photo opportunities. • Peel and chop the sweet potato. • Sautee the sweet potato until soft enough to pierce with a fork. • Simmer black beans for 10 minutes. • Place in a corn tortilla with avocado salsa and feta cheese. Enjoy! regional or national championship due to financial constraints. This element of the plot addresses privilege and how the lack of hurdles to achieve a common goal is selectively applied for those who don’t benefit from current infrastructures. Having both Torrance and Isis representing female leadership continues to inspire many young girls to start pursue cheerleading themselves and/or aim for leadership positions as it did when the movie was released. The film also showed the importance of standing up for yourself and accepting responsibility as a true leader and not shying away from your mistakes. This film was the first installment of the “Bring It On” film series which rounded out to six in total with five direct-to-video sequels: “Bring It On Again” (2004); “Bring It On: All or Nothing” (2006); “Bring It On: In It to Win It” (2007); “Bring It On: Fight to the Finish” (2009); and “Bring It On: Worldwide #Cheersmack” (2017). Each film revolves around a team pursuit of winning an upcoming cheerleading competition where unexpected roadblocks come up along the way. The small budget of $11 million that resulted in a No. 1, $90.5 million debut in the box office, a popular, easily recognizable Halloween costume and iconic quotes like, “I know you didn’t think a white girl made that sh*t up,” this film is an easy addition to the cult classic category. “Bring It On” has, is and will continue to bring it. Ready? OK! Open mic night | 8 - 9 p.m. | The Backyard Bar Stage & Grill | The local venue and restaurant will host its weekly event with slots given on a first come, first-served basis. Lady Bears searching for answers amid rough season NOAH TORR Executive Producer The Baylor softball team has faced their fair share of adversity this season but are looking for a midseason revival. The Lady Bears sit at 15-17 on the season and are still trying to find their footing after losing key players to injuries like starting pitcher Gia Rodoni. Coming off of last weekend’s series against Oklahoma State, head coach Glenn Moore was worried about his young team. “We’re not a great team right now and we know that,” Moore said. “I don’t mean to bash the talent that I have; we’re just young.” Moore said he takes some of the blame but wants to grow this team and at the core of growth is the fundamentals. “We have to go back to making our warm-up drills more important to us,” Moore said. “Our angle steps, our on deck at-bats and just doing the little things right will help right the ship.” The odds were stacked against Baylor going into their game against the University of Texas on Wednesday and while they did lose the game, Moore said he was impressed with how his team competed against the ninth best team in the nation. “We’re asking a lot of this team that’s pretty young and pretty banged up right now and to compete against a top-10 team the way we did I’m proud of the team,” Moore said. “If we play this way this weekend we could get some big wins.” Starting pitcher Sidney Holman is confident in her team but said they need to make sure they’re making it a competitive game. “With our defense, as long as we keep improving it will be fine,” Holman. “As long as we can get some runs up on the board.” The Lady Bears face Stephen F. Austin at 6 p.m. Tuesday at Getterman Stadium. EAST REGIONAL CHAMPS Baylor head coach Kim Mulkey celebrates Baylor’s 85-53 win over Iowa by cutting down the nets with her daughter and grandson. The Lady Bears will face Oregon on Friday in Tampa Bay, Fla. GOING UP STRONG Baylor junior forward Lauren Cox goes up for a layup against Iowa on Monday in Greensboro, N.C. Cox finished with 22 points and 11 rebounds as the Lady Bears defeated the Hawkeyes 85-53 to advance to the Final Four for the first time since 2012. Baylor will play Oregon on Friday in Tampa Bay, Fla.
TOP DOGS Baylor sophomore Sven Lah (left) and senior Jimmy Bendeck (right) survey the competition in a match against TCU on Friday at the Hurd Tennis Center. HIGH FLIER Baylor senior Jimmy Bendeck (left) and sophomore Sven Lah (right) compete in a match against TCU on Friday at the Hurd Tennis Center. Bendeck and Lah are the No. 1 doubles team in the country.